How can I use PMXE to create new bones in my MMD model? What is Rigging? What are “bones” in PMXE? How do I make eye bones? What does the PMXE append field do? How can I make my MikuMikuDance model easier to use? 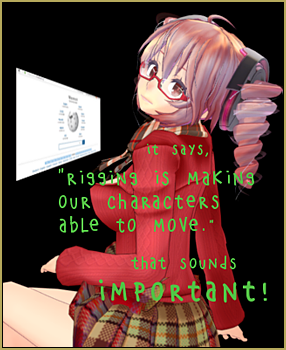 RIGGING WITH APPENDS– AND KASANE TETO! Riggers take care of all the jobs that make the animator’s life bearable, so that the animator doesn’t have to push individual vertices around. 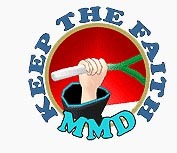 MMD uses skeletal animation, so a big part of rigging in MMD is about the creation and placement of bones. Bones are points. They should have been called “joints” from the start, but it’s too late for that now. Bones aren’t lines. They don’t extend into space. Those lines leading to the child or offset are meaningless as anything except a visual aid. Bones are points around which other points (vertices and other bones) rotate. If you think of them as lines, you’re going to run into problems over and over again. I still find myself thinking of them as lines– and making mistakes because of that. Bones are sequential. What does that mean? It means that they need to be in a particular order. We all know that children need to follow parents, but why? It’s because the position of the child depends on the position of the parent, but not vice versa. In order to know where the child is, we need to first know where the parent is. Parent/child relationships are not the only place where this is important, as we’ll see. or Open the PDF to read the Tutorial! So using this tutorial and information I can make existing motions work on my model? So what exactly am I doing though? Am I using appends or do I rig? How do I rig? When my model plays on an existing motion, the angles are off and sometimes the model moves in weird ways. I deleted all the extra vertices and fixed the IK bones angle limit thing. So what do I do? If existing motions aren’t working well, there are probably more basic things that you need to be focusing on. First, existing motions are always going to need tuning for other models. Simple differences in proportions and bone length are going to mean that what works for one model won’t work for another. Rigging itself refers to the process of bone positioning and tweaking, and to most MMD users, to weight painting. There are some tricks you can do to make existing motions work better. If you have a video you can upload anyplace, please post a link! I’ll be happy to take a look at it, and I might be able to make some suggestions based on what I see. If you have a download link for your model, I could take a look at that instead. Adding to the answer above: existing motions rely on assumption that the acting model has the same (or at least, no lesser) set of bones and facial expressions as the one that the motion was designed for. While a basic minimal set of bones is common for most models, there are individual differences. For example, many models have so-called “groove bone” complementing the center bone, but then again, plenty of models do not. If an existing motion has instructions for a groove bone to move, in a model without it they will simply not translate to anything at all, and the motion will not look as intended. Plenty of models are still distributed without a motherbone, despite its obvious usefulness. Another example is a model that I have that has a chain of two upper body bones instead of just one. In poses and motions I do, it allows for better spine flexibility, but had I tried to share those with others, they’d be useless. What you read about in this article is an example of “advanced rigging”, allowing to enhance your models beyond their basic capabilities in order to perform very specific motions you intend to use in your video but have difficulties to do without customization. You can read more about what is involved in rigging in a different article. Supposedly it’s a common courtesy to only use basic bones in motions that one intends to share as motion files, but there’s no guarantee that in a motion you have this approach was followed meticulously. It may be that your model misses a particular bone or two that the motion requires. Then again, various models’ shapes differ, so, as bandages said, even for models with matching bones structure a motion has to be adjusted before it looks good.